To understand where we’re going, we need to analyse where we come from. 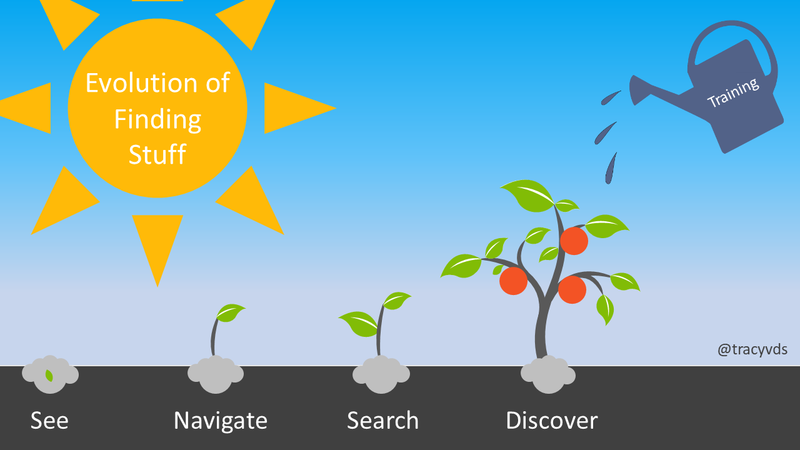 Before users can start using advanced technologies, for example Delve and Microsoft Search in Bing, they need awareness on the evolution of search, and how they’ve been finding content. This also helps highlight the areas where improvement is needed. Perfect example of this would be people putting files on their desktops. When they can see it, they can find it. Shortcuts to every program you use on your desktop / taskbar or double-clicking through folders to find the file you’re looking for would be a great example of ‘navigating’. Multiple folders in Outlook because you cannot find emails is another. The World Wide Web (WWW) taught us to search. Sadly, this never really spilled over into users’ pc use. The Windows button was brought out in 1992, but very few people know they can use this to search their pc for programs, files and settings. How do we discover content daily? Facebook suggests articles we might want to read, Google changes our search results based on previous searches, YouTube shows videos we might want to watch, Pinterest compiles content in boards for us to enjoy and in Microsoft Office we use the Recent Files and Shared with Me to find files faster, Delve / Office Graph gives us results based on content and people we work with etc. Digital literacy, or PC literacy as previously known, has a much greater impact on user adoption than anticipated. 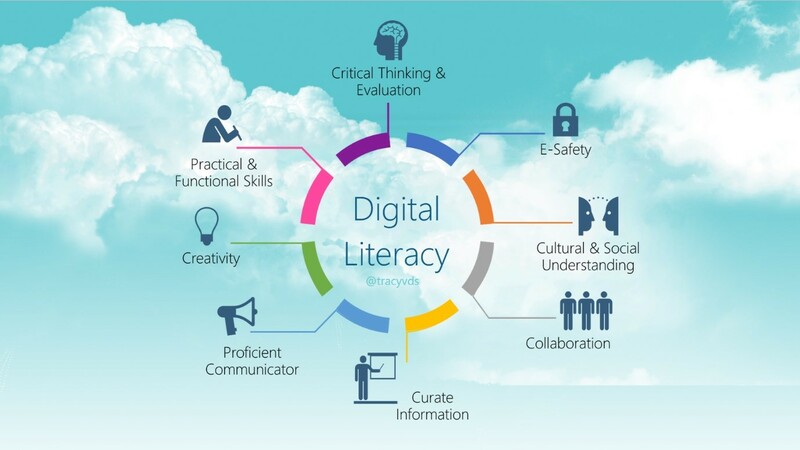 Research has proven that approximately 70% of users are not PC Literate (digital literacy would be even lower). Before more advanced technical skills can be added, we need to go back and ‘fix’ the foundation that has been broken or is completely missing by supplying the basic training need to work more efficiently and effective. 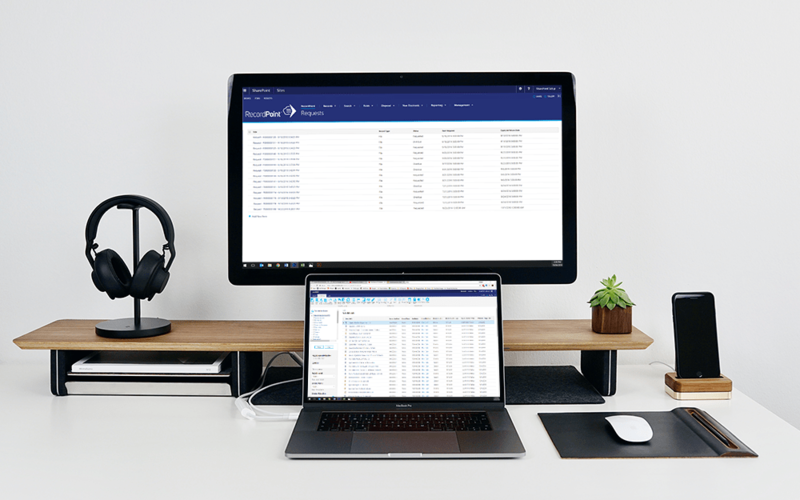 When upgrading to newer software or platforms and considering cloud technologies, the biggest saving is always depicted as ‘cost of ownership’. This would refer to lower numbers of staff in IT departments and infrastructure. It’s important to remember that some of this cost will move over into business with Citizen Developers starting to develop their own apps in their departments. If done right though, the biggest cost ‘saving’ would be the investment in users. Research shows that with basic pc literacy training, users can be 33 minutes more productive per day. Add to this the ‘time saving’ features in Office 365 and you could easily look at productivity savings of at least one hour per day. When you calculate what the yearly ‘savings’ is on an hour per day for all your users, it’s staggering. 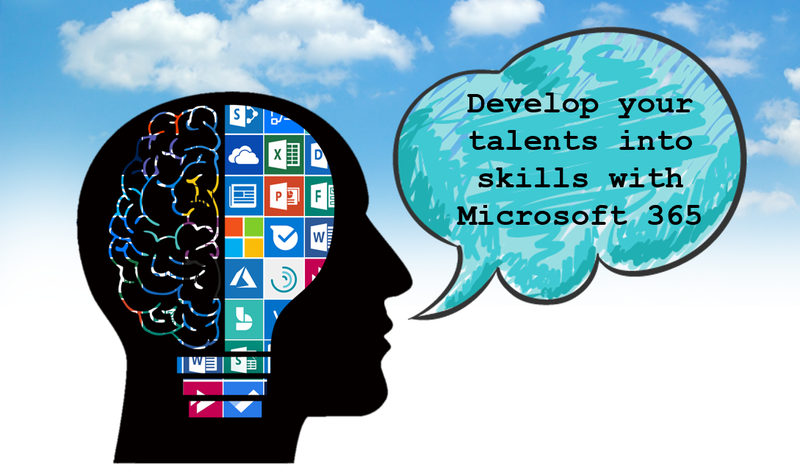 Office 365 brings with it many features that can empower users and simplify their tasks. This requires changes to their job descriptions, as responsibility not documented will not be honoured or taken seriously. We also need to empower them to use those features wisely and this would not only include technical skill, but also the soft skills needed to plan, build and deploy successful solutions. The way we train and deliver IT support should also change. Traditional training no longer suffices as we need to train users to not only use technology, but also become self-learners. The vast number of features being added daily does not allow for continuous, traditional training. IT support has always been about fixing problems. To support the above scenario, we need to help users, help themselves. Technology might have changed, but the way we roll it out shouldn’t. Even more focus should be put on Change Management, as the change is SO much bigger than before. 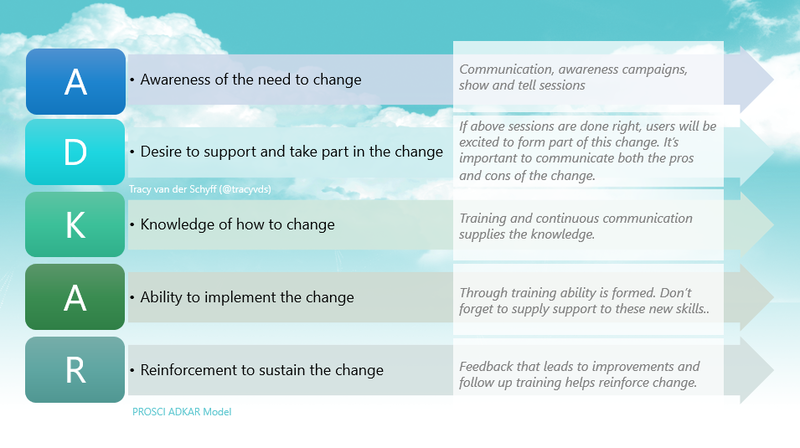 I follow the ADKAR (PROSCI) model for change management as it’s simple, yet effective. Keep in mind that there are many psychological factors to consider, users don’t resist just because they’re being difficult. Spend time to understand why technology is being resisted and you will not only gain empathy, but also have the ability to develop successful roadmaps for your deployments. Facilitating the evolution of human capabilities – Tracy’s passion is to empower people, therefore training and change management lie close to her heart. 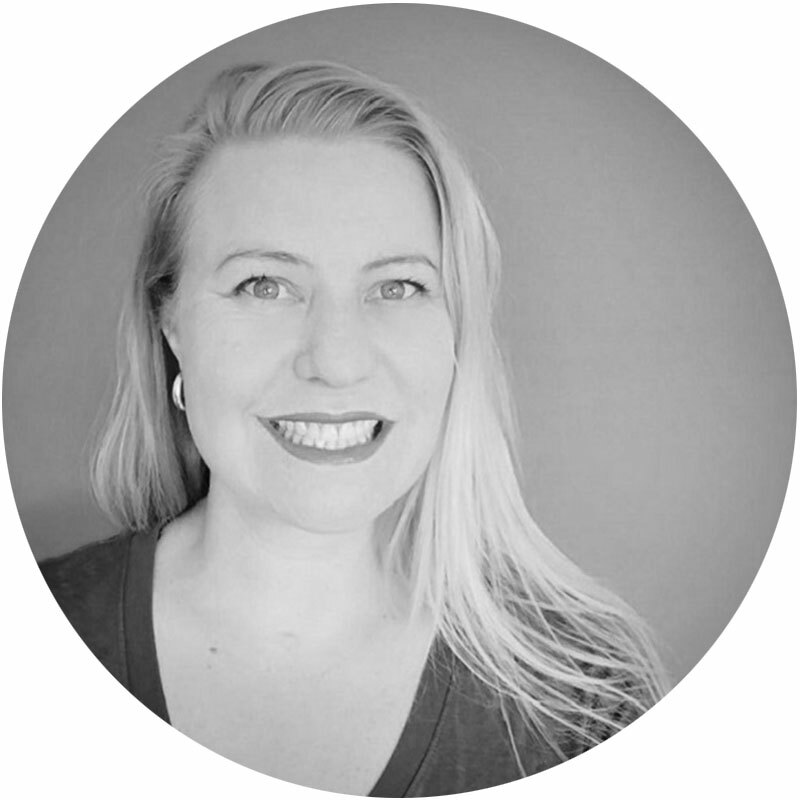 Her mission is to positively impact WHAT and HOW people create, as she believes that what we design and create, designs and creates us back (Ontological Design). It is about enabling others to serve themselves better, expand their possibilities, increase their capacity to learn, act more effectively and better design their future.